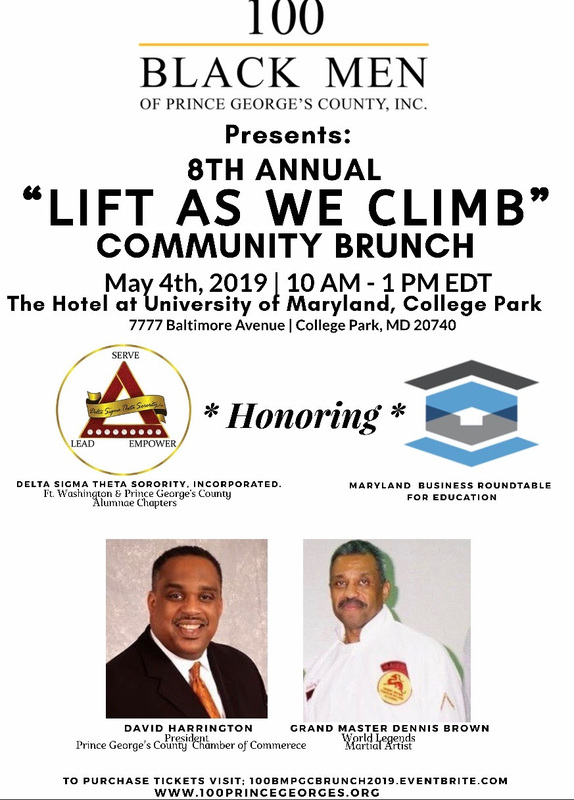 Mark your calendar for Saturday, May 4, 2019 and join us at the 100 Black Men of Prince George’s County’s “Lift As We Climb” 8th Annual Community Brunch. The brunch event will be held at the “top of the class” The Hotel at University of Maryland from 10:00 AM to 1:00 PM. You may purchase tickets online at: 100bmpgcbrunch2019.eventbrite.com. The deadline for purchasing advertisements or sponsorships for our upcoming “Lift As We Climb” 8th Annual Community Brunch is Friday, April 19, 2019. Secure your program ad or sponsorship TODAY! The 100 Black Men of Prince George’s County, Inc. is a 501(c)(3) nonprofit organization.